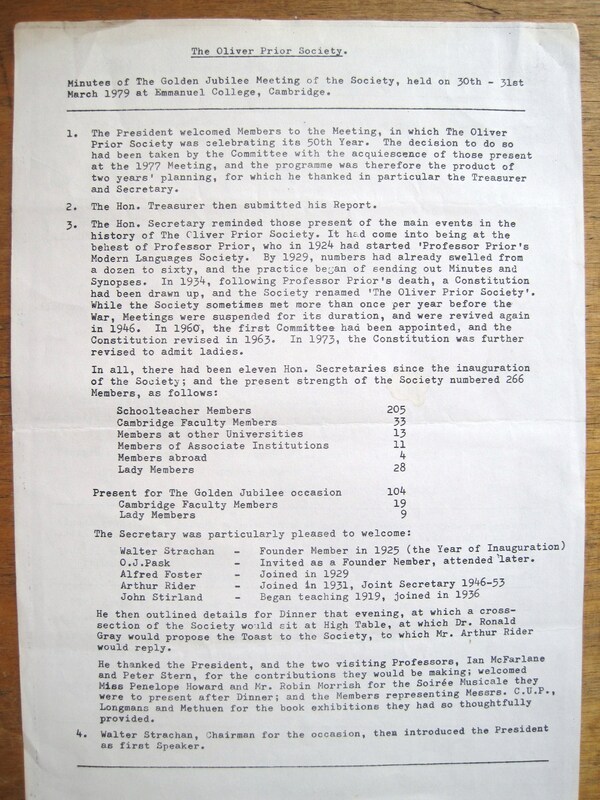 The Oliver Prior Society celebrated its Golden Jubilee in 1979 during the annual meeting held at Emmanuel College, Cambridge on 30 and 31 March. Of these 266 Members, 132 turned out for the 1979 meeting, including 104 teachers, 19 Faculty members and 9 ‘Lady Members’. The Society asked its oldest member, Walter Strachan, to chair the address. Dr Ronald Gray (Emmanuel College, Cambridge) proposed the toast to ‘The Oliver Prior Society’. Records show that the Society’s second oldest member, a Mr A. Rider, was invited to reply. 9.30am Professor I.D. Macfarlane, Oxford University’s first Professor of French Literature, addressed the Oliver Prior Society for the second time – his first lecture was given in 1956. Professor Macfarlane retired his role in 1983, and the Professorship was not officially filled again in 2001; Professor A.W. Raitt held the post on an ad hominem basis between 1983 and 1997. A former student and fellow of St John’s College, Cambridge, Joseph Stern was a distinguished professor of nineteenth- and twentieth-century German literature and philosophy. He was also editor of the influential Cambridge series Landmarks of World Literature.